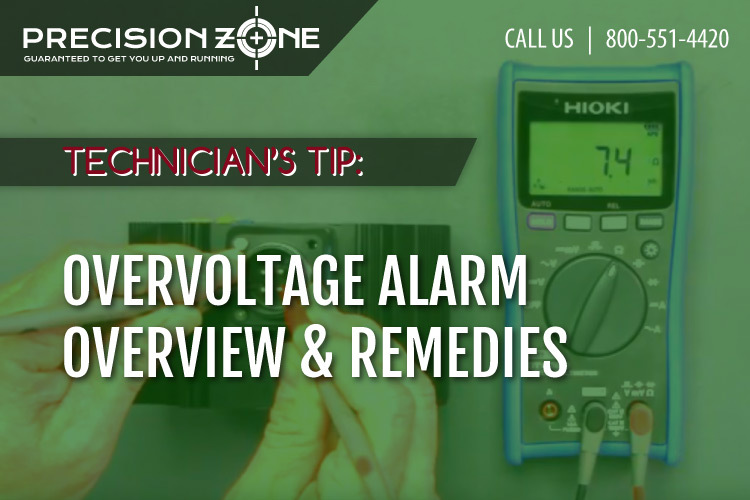 This month's tech tip, we will be covering overvoltage (OV) which is a common alarm on many drives. The description for overvoltage is the DC bus voltage has exceeded the trip point. The trip point can be caused internally to the drive such as the input power, but it can also be caused externally for example through the drive's parameters. The trip point is set in the protection circuit of your drive and cannot be adjusted. If your drive uses anywhere from 208 - 240 VAC, then its tripping point is around 410 V for the DC bus. If your drive uses anywhere around 480 VAC, then its tripping point is around 820 V for the DC bus. It is crucial to understand the DC bus voltage is constantly fluctuating during the operation of the machine. The machine has multiple actions which affect the DC bus operation. They are acceleration, deceleration and constant speed on the machine. Acceleration and constant speed are not common actions which cause DC bus overvoltage, but it is still possible. The most common cause of DC Bus overvoltage is during the machine's deceleration stage. For example, a machine performing a tool change must go through a deceleration phase first before the tool change can take place. The deceleration can cause the drive to trip with DC bus overvoltage for a couple of reasons. First, if you have set the declaration times in your parameters too low, then the DC overvoltage is likely to occur. C1-02, C1-04, C1-06, C1-08 are the deceleration times. These times are all connected together since they all belong to the same deceleration curve which you can set also. C1-02 deals with the initial slowing down on the deceleration curve. Also, C1-02 will have the steepest slope upwards for deceleration. Therefore, it will take the most voltage potential from the motor. The rest of the parameters deal with bringing the machine to a smooth stop. C1-02 can be set anywhere from 0.0 - 6000 seconds, but the lower limit of the parameter is not attainable in many cases. I will explain why. First, let me explain how the drive and machine work. The motor which is controlled by the drive transforms the electrical potential to kinetic energy which we see as the motor rotating and speeding up. When the machine is decelerating, kinetic energy is transformed to electrical potential energy which it taken away from the motor. The lower C1-02 parameter is set, the more kinetic energy needs to be pulled out of the motor and transformed to electric potential energy. All the electric potential energy needs to be temporality stored in the capacitors which are directly linked to the DC bus voltage. Hence, if you set your C1-02 parameter too low, you will go over the trip point since the DC bus voltage will temporarily exceed its limits. Many machine manufacturers such as Hurco define what your parameters in C1-02- C1-08 should be in their machine. You can refer to the bottom for Hurco machine references. Now, if your C1-02 parameter and other C1 parameters are in reasonable ranges, then it is time to check out your braking resistors or braking unit. The braking resistors or braking unit should be dissipating the extra potential energy in the DC bus. If the braking resistors or braking unit are the incorrect values or too old then the energy will not be dissipated at all or quickly enough. Therefore, the DC bus voltage will exceed the trip point and set off the internal overvoltage alarm. If the braking resistors are extremely hot or smoking during deceleration, this is an indication that they are broken or need to be replaced. If all objects or parameters mentioned before don't correct the overvoltage alarm, then the regeneration transistor has probably has been damaged. This is especially true in the case of intermittent overvoltage alarms on the drive. Hence, I would suggest sending the drive in for repair.